This weekend was full of all sorts of fun things. Normally I deep condition my hair and do a face mask on Saturday but I was at my moms house late last night and didn't feel like doing it when I got home. So now I'm sitting in my living room watching Quantico, writing, and letting my hair and face soak. I'm honestly impressed that I managed to finish everything on my list and have time to do it today! I woke up yesterday and dashed to the barn for my lesson. It was my last official lesson with the current trainer so it was fairly bittersweet. We worked on various exercises to help us loosen up while riding such as standing at the trot, two-point, and hugging the horse. Cupid did amazing during this lesson! She's used to me working on standing at the trot and two-pointing but the hugging at the trot is a new concept. We've encountered it in lessons but I always feel like I'm going to go over her shoulder so we never work on it. Honestly I think we "jumped" better than we ever have before. My trainer made us hug our horses through a simple 6 stride line and Cupid rocked it! Normally she zig zags through her lines but during the hug exercise we had very little drifting. She did attempt to refuse one of the last jumps but I felt myself release my right leg and pop that heel up. After the lesson I dashed over to my moms house to shower and change. She had signed us up for a boat tour in Mt. Dora through Premier Boat Tours. The tour was 2 hours long and went through Lake Dora, and the Dora Canal. I enjoyed the tour and found our captain, John, and skipper, Sandy, to be very pleasant. The houses along the route were fun to look at and the plants were fascinating. I especially enjoyed the cypress groves. The way the trees have grown and become "tangled" with other vegetation was enchanting. The only negative of the tour was that a good portion of it was spent pointing out alligators and trying to find them. I understand that tourists are amazed by the Florida gator population but after running past ponds with them, daily, they no longer captivate me. From the boat tour we headed to PDQ for dinner. My brother has become addicted to their Buffy Bleu sandwich and was excited to have me try it. Because I wasn't feeling like a sandwich I went with the chicken tenders which were amazing. The breading was just right and the chicken tasted extremely fresh. I plan on going to PDQ again so that I can try more of the menu, possibly even the Buffy Bleu! They don't look like much but they were really good! When we got back to my moms house I helped her clip the dogs nails and back wash the pool for the first time. I had previously back washed the community pool I used to work at but never a smaller personal pool. It didn't take too long to back wash but neither of us had realized doing so would drain the spa. As soon as we turned the filter on we could hear this spraying sound, like someone had turned on a fire hose. It was the jet of the spa shooting water into the wall, which was then spraying all over the deck! We played with the filter, turning it on and off, and trying different valves until we realized that the jet was supposed to be doing that. The back washing had drained the spa and the jet was refilling the spa using fresh pool water. The spa successfully filled and the water actually seemed to appear clearer! Once we were doing playing with the pool filter and spoiling the dogs, I headed home to get ready for the next day. This morning I woke up early and immediately went out on a run. I put in 1.9 miles at an 11'56" pace. There was a lot more walking than I wanted, but I finished my run feeling good and not like I had worn myself to the bone. I'm going to work on focusing more on building my endurance then bring speed back in a few weeks. I want to get faster but I think I need to get my endurance back first. When I finished my run I flew through my errands for the day. 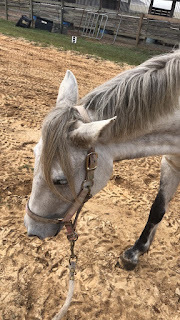 I had to do several loads of laundry, clean the house, meal prep for the week, clip the Tweedles nails, and tend to the plants in my backyard, all before going out to the barn to work with Cupid and do the barn chores. I'm proud to say that I completed everything and still found time to read for a bit before heading to the barn! I'm currently reading Wintergirls by Laurie Halse Anderson. I'll do a quick write up of it once I finish! While doing my errands I received a text from one of the other girls at the barn. She had randomly decided to work with Cupid and successfully got Cupid to stand in the water that was flooding sections of the paddocks. Normally Cupid will do everything she can think of to avoid standing in the water but this girl managed to get her to walk through a few puddles! As much as I want to be the one to exclusively work with Cupid I am extremely proud that my pony wasn't a holy terror and learned something new. My weekend might not have been too exciting but it was extremely fun! Well, I did great at my morning training run!